You have reached the site for all things Swan Island, a small wildlife game preserve island located within Sagadahoc County, in the Kennebec River between Dresden and Richmond, Maine. Information and a link below will guide you to the site where you may make reservations for camping or day-tripping to the island. Some special events will intermittently be highlighted below. 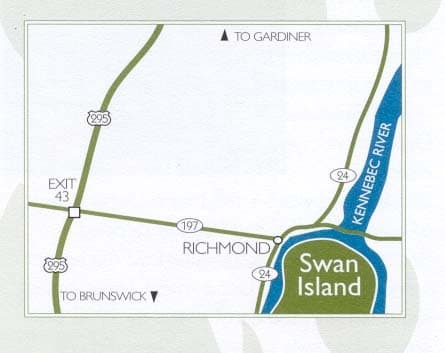 Directions & Map – To get to Swan Island, take Route I-295 to Exit 43 (Richmond/Litchfield). From the exit, follow Route 197 East for approximately 3 miles to Richmond Village. Turn left at the intersection of Routes 197 and 24. The Swan Island parking lot, marked with a brown State of Maine sign, is immediately on your right, next to the brick Richmond Utilities District building. Board our ferry for the five-minute ride across the Kennebec River to your remote getaway…close to home. Once on the island, you can begin your exploration or travel in our tour truck to the campground. From here explore the campground area and homes, rent a kayak to explore the islands, walk the scenic gravel road to Theobald Point, or begin exploring 7-miles of hiking trails. As a Director of the Friends of Swan Island, and the Dresden Historical Society, member of Lincoln County Historical Association, the Pownalborough Courthouse Stewardship Committee, Friends of Merrymeeting Bay and Bath and Pejepscot Historical Societies, and part time resident of the island during the 1950-1960’s, I was inspired to research local history and work with local historians in preparation to write book ONE of the Swan Island trilogy. Enjoy reading CHAPTER ONE below! LIKE or FOLLOW this author site for more information on the SWAN ISLAND trilogy. Journey to Sowangen, Island of Eagles. INDIE bookstores in your Kennebec Valley neighborhood! BOOK TWO: currently in manuscript: Swan Island in the Kennebec – Perkins Township & Swango Health Spa Arise from the Flames of Sowangen. BOOK THREE: Swan Island in the Kennebec – Steve Powell Biological Station, State of Maine Wildlife and Camping Destination. The trilogy of historical novels invite readers to enter the world of the isolated island where the village of Perkins Township was incorporated and thriving in 1847 but abandoned in 1938 when ferry service was discontinued, too few residents to hold town offices, when the island became State of Maine property beginning the Steve Powell residency. Steve kept meticulous records on wildlife and weather conditions, which are currently being digitized at the State of Maine Archives during winter 2018-2019. Hiring Parker Blen (who with wife became the resident caretaker for 20 years) enabled Mr. Powell to record statistics on duck & geese population and plant fields of various grains harvested as feed for deer population. Deer repellants were trialed in the fields during that time. The Steve Powell Wildlife & Camping island story is included in book 3. Not all residents of Sowangen arrived from Europe! Indigenous people clashed with greedy English fishermen who kidnapped and pushed upriver into forbidden Abenaki hunting grounds. Wealthy investors imported settlers to build towns, industries, and ship ice, lumber, sailing vessels and produce worldwide. The trilogy brings the reader into a virgin locality where Indigenous Peoples governed, worshipped, raised their families and struggled to maintain the sacred lands where they had lived for generations. When Englishmen began to arrive and claim lands the People of the Dawn considered their home, clashes arose. Sowangen was the home of Abenaki Chief Kenebiki who lived in his stone fortress under the eyries of great bald eagles who kept watch over his people. Reading the trilogy will reveal the many faces and phases of how a tiny island in Maine became the hub of where a state was born. GARY LAWLESS of GULF OF MAINE BOOKS IN BRUNSWICK, MAINE! FREE READ – CHAPTER ONE! Long before Zanoba was yet born in 1593, scarlet flames from a bonfire reached their curling tongues higher and taller against the blackened sky as tribal elders performed their storytelling dance, throwing long shadows across the ring of engrossed villagers. Representing many gens (families, tribes or bands) of Wabanaki, the People of the Dawnland came from territory between Eastport south to York all along the northeastern seacoast, extending westward toward their sacred mountain Mount Kineo, where legendary Gluskap created all life, as the Abenaki Confederacy understood it. Great sea eagles soared through the skies, not to be taken for granted, however. One never knew whether a spirit-guide might be watching native activities. Passing a large lobster-claw pipe, sun-bleached red and filled with dried nicotiana rustica leaves to the brother at his left, Zanoba’s grandfather, Awasos, (born in 1564 to a 16-year-old native maiden), sat nearly motionless in the circle at the fireside watching the lively dance long into the night. Later, when the moon rose higher in the sky, the dance gradually wound down, and quiet prevailed blanketed by the silvery moonlight. Native children slumbered near their mothers on luxurious fur-covered spruce-bough beds. After chasing each other all day even the village dogs were silently lounging at the perimeter of the bark huts, ears perking up at the slightest alert of danger from deep within the forest. The only sounds were occasional echoes from a pair of gokokhoko’s emitting a repetitive hoot-e-hoot, hoot-e-hoot call throughout tall trees in the distance. Except to flick off stray sparks landing like darts on darkened, weatherworn bare flesh, all present appeared hypnotized by nesting rings of smoke rising higher and higher from the communal claw pipe. Verbal confirmations and forthcoming answers to their questions were expected at the conclusion of the dancing when the fire quieted down. All present then moved in closer to his brother, tightening the circle into a more intimate gathering where finer details of their history could be learned. Each man could feel the body heat, feel the breath, and nearly hear the rapid heartbeat of the brother next to him. The women and girls quietly listened from the outer circle of huts as they tended to sleepy children until they drifted into deep slumber. Females had their own conference, held in quiet whispers, speculating what direction the gen might take, what the impact might be on their, and other connected villages, prepared to vote when the men were done conferencing. They were the proud people of the Wabanaki First Nations who called their land Ketakamingwa, meaning the ‘big land on the seacoast.’ Believing the Great Spirit Gluskap created them, the People of the Dawnland lived between their sacred Mount Kineo and the rocky saltwater coast from Eastport to York, Maine, where the sun first meets Mother Earth each morning. Particularly during that time, Natives treasured spirit-guides, some recognizing bears, coyotes, wolves, turtles, sturgeon, snakes, or perhaps eagles. However, until a native spent time in deep reflection, or faced a life-altering circumstance, it was often only creatures recognizing their status as spirit-guides. Numerous interconnecting rivers, streams, ponds, and lakes provided the only existing inroads to more densely forested areas. Carrying places provided short dry land paths across which canoes must be carried on the shoulders of two or more hardy souls from one body of water to the next, allowing a continuous route of access to their destinations. Abenaki bowmen marked trees with graphic symbols leaving a map for the safest routes used by traveling brothers. Boulders, granite ledges, swampy areas, muddy creeks, downed and rotting trees, or stumpage prevented their fast travel by land. Only well-worn footpaths provided access to inland areas. No roads yet existed, were unknown and unnecessary. Horses, wagons, and carts did not arrive on the scene until years later. Hunting, trapping, or fishing in those areas linked by land paths offered not only food but furs for clothing and bedding in their birch bark and fir bough lodges. Awasos, Zanoba’s grandfather, a young man of 20, was the first eager voice to make an inquiry of the dancers when they squatted to rest their bottoms on their heels or sat on the furs spread on the ground before them. One of the brightest in the village, Zanoba’s grandfather asked many questions and could offer exacting solutions to daily challenges using his sharp mind, innate curiosity, and ability to listen. Unarmed, Awasos had been fearless the day he saved a young girl from an attacking wolf, receiving a nasty wolf bite through his right hand. Despite the herbal wraps, bark teas, and berry concoctions, the altercation took the smallest finger and left a jagged toothsome scar in the center of his palm additionally visible on the back of his hand. Thankful to have retained his hand at all and to have saved the girl unharmed, he continued feeling rewarded through the respect of his people who elevated his status to that of a living legend. All brothers in attendance on that day were looking for guidance on their next steps for whatever was the most beneficial direction for their gen. Native Americans, including the Abenaki people, thought collectively about any action for the benefit of a group rather than harboring selfish individual pleasures or gains before considering the family. With the talking-stick in hand, Awasos stood up, as was customary when addressing a question to the elders. He stood straight, a handsome brave of six foot, three inches in height, holding the talking-stick outward from his body. Reaching out his scarred, 4-fingered hand, he lifted the massive crustacean claw to his lips, taking a long draw of tobacco smoke into his lungs. Straightening his spine to full height, he raised his eyes to the sky. Blowing several stacked rings of smoke into the air, he licked his thick parched lips before beginning to speak. Many pairs of flint black eyes were trained upon him as he began to speak. “More strangers have followed in great wooden ships blowing across the sea under big white clouds. Fifty-eight of our family members were taken as captives (and sold into slavery in Spain). Robbed of the vast and abundant namas that swim in our rivers maybe they will trick more brothers or sisters into joining them in floating away this day. What action would you advise to prevent these losses to our family? How much more of our lives can we watch slipping from our hands before all is gone and our ancestors forgotten?” Concluding his question, he passed the talking-stick to the brother next to him, and each passed it swiftly along to the next with many moments of silence until it returned to Awasos, who had waited to hold it again for what seemed to him years of silence. The elders remained seated on layers of luxurious bear pelts, nodding among themselves for many moments following Awasos’ question, his pearly white upper teeth involuntarily clamped down on his thick bottom lip, nearly biting through as he waited. He had voiced the question everyone seated at the fire had in their minds although few would have found the fortitude to ask. Awasos also knew when the spokesman began that it was his responsibility before receiving any variation of agreed-upon ideas first to present a working version of the solution. It was their way, their tradition, their teachings, he understood. Time seemed suspended just then until more pegues swarmed to attack. Brother Ahanu arose to tend the dying embers, poking at the fire pit in a daze, prompting spires of brilliant yellow, crimson, pearly blue, orange, and sea green to fly high up into the cool night air. The smoke and heat of the fire would afford some comfort, keeping away the pesky chomping insects! The bear grease and mint leaf they wore as a skin treatment helped only just so much to ward off the annoying pegues. Many pairs of large coal black eyes reflected bright sparks shooting from the campfire and the glow of stars as they waited. Awasos slowly sat down on his fur cushion, mindlessly stroking the thinning sole of his left moose hide moccasin in a slightly circular motion with his thumb as he sunk deeper into his thoughts, regulating his breathing. The lobster claw pipe continued to silently circulate, allowing those who had witnessing the storytelling dance a few moments of freethinking. Awasos returned to simpler memories during that moment, vividly remembering having watched as his grandfather hollowed a log from a downed tree destined as a canoe. He could not imagine how the log could be transformed into any sort of watercraft. In his minds eye he saw his grandfather first gouge down along the center length of the log, and then slowly burn the insides with charcoal embers until enough charred wood could be scraped out. This process formed the interior of a sturdy and heavier canoe that could sometimes accommodate as many as 19 of their village people. Awasos had learned the second canoe design and was honored to participate in building a lighter boat construction. This design, his grandfather had explained, was made from layers of birch bark meticulously peeled in large sheets by skilled hands and sewn together with strong cedar roots. Lastly, all seams between sheets were caulked, or waterproofed with pitch from the numerous pine and spruce trees spread across the land. Awasos had not forgotten his wonder at the magic of seeing so many nearly identical sheets pulled from one piece of birch tree. He remembered the bottom of the canoe being lined with lengths of sturdy bark, allowing the weight of passengers to step into and down along the length of the craft. As a young boy, he had repeatedly walked back and forth on the bottom of the nearly finished canoe while his grandfather was otherwise occupied with finishing details of the canoe. Generations since have copied and used their original Native American design without improvement or change for over three centuries. Other Abenaki inventions Awasos remembered were durable moose hide moccasins and snowshoes, practical designs that continue to be utilized in our current lifetimes in harsh Maine and other New England climates. Ash and birch bark baskets and containers were invaluable in collecting water, gathering berries, groundnuts, roots, and Indian tobacco leaves. Birch bark pots were used in cooking some foods and baskets were used in storing dried corn or seeds. Tools were mainly crude edged but sturdy enough to survive the elements, only a few continue to be found intact to this day. Mount Kineo arrowhead-points and flint seemingly never decay as evidenced by several local archeological digs dating up to the year 2017. At last, the Elder spokesman reached to grasp the talking-stick from Awasos, which he handed directly back inviting Awasos to speak before them with a consensus of his well-considered solution. Awasos stood again as straight as possible, glad to climb out of his sitting position after so long. A puff of wind blew bonfire smoke in his direction stinging his eyes but did not deter him from speaking his solution. He held the talking-stick firmly in his left hand. Even if his idea was not considered a good one, he knew the group would support him, adding enough suggestions to form at least a mindful alternative. “I believe when Gluskap set us upon Ketakamingwa he had a plan for all time. He has sent many signs to show us how to survive using all that he and Mother Nature have provided. Maybe he did not know of the men who continue to float from far across the vast lake of salt who come to steal the resources of our ancestors.” As he spoke, Awasos outstretched his arms, making an arc in the air around him as he was talking of the vast ocean. “If Gluscap did foresee these things, he could not have had knowledge of their devious and selfish ways. It is our challenge to become friendly and encourage these men to share our bounty, to work together for the good of the land. We have learned peaceful ways with some of our brothers to the south that were not friendly at first contact. We know these men can be kind. Our brother to the south, Sachem Messamouet, visited their land across the water (France) and returned to report to us that he was treated well in the house of the Mayor of Bayonne years ago. We know it is possible with others! We have furs to offer in trade for what they might bring from their strange land far away, and we may find these items useful in our villages. We have gifts of golden bracelets or shiny swords and coins from visitors to Mawooshen and Norumbega long ago. We know not what more shiny metal objects they might have to trade for our furs.” Awasos concluded by saying, ‘Let us be friendly and fair in sharing but wary of aggressive behavior or tricks to capture any of our people. '” He was astonished when the elder spokesman stayed seated, did not reach for the talking-stick, and nodded in unison with all the others. Awasos’ idea was successful in that part of the territory for close to 100 years. I will have a 20-25 minute documentary rough cut for you, Jay, T. Blen Parker and others to review in a few months. Labor of love – I grew up on the Kennebec and only recently began recreating on the river. .
Hello Patrick! This is such exciting news! I cannot wait to find your documentary about the Kennebec in my in-box soon! I am in the throes of putting together the village of Perkins in BOOK #2, to include all the rich details about the first settlers on the island and the businesses they managed while building an island town, deciding to become independent from the two river towns between which they are sandwiched! Thank you for putting together your project!